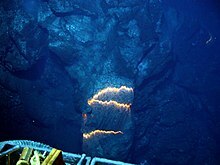 ↑ "Scientists Discover and Image Explosive Deep-Ocean Volcano". NOAA. 2009-12-17. अभिगमन तिथि 2009-12-19. ↑ अ आ Martin R. Speight, Peter A. Henderson, "Marine Ecology: Concepts and Applications", John Wiley & Sons, 2013. ISBN 978-1-4051-2699-1.